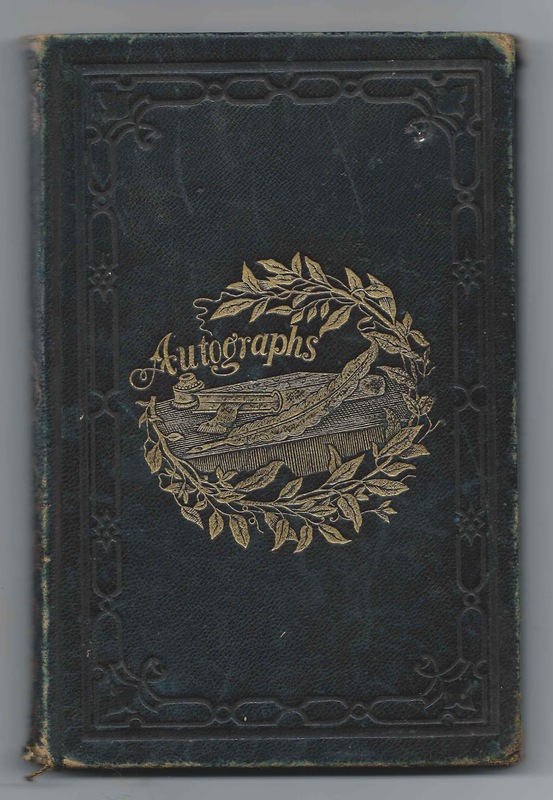 1863-1899 autograph album that may have belonged to Adoniram Judson Dunbar of West Bridgewater, Massachusetts, whose name appears on the inside front cover and one of the end papers. 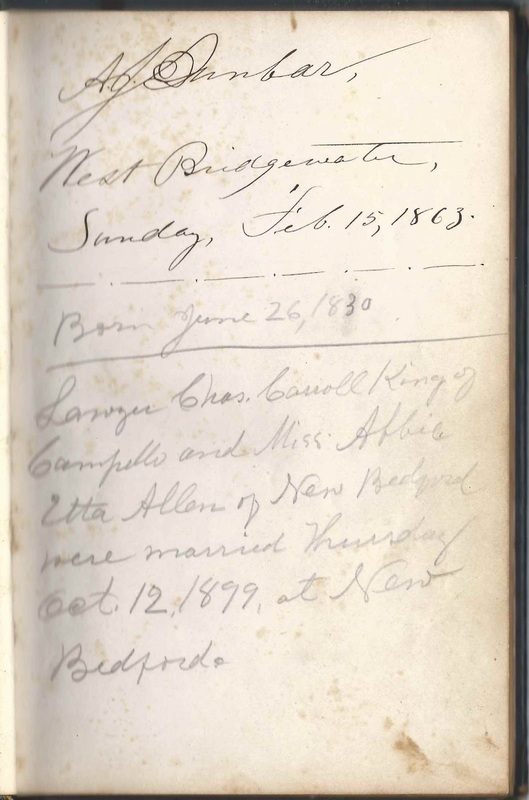 The page above also notes that lawyer Charles Carroll King of Campello, Massachusetts, and Miss Abbie Etta Allen of New Bedford, Massachusetts, were married on Thursday, October 12, 1899 at New Bedford. Whether or not Adoniram himself or someone else added the note I don't know. There are many notes added to pages indicating when the signer was born or died. Many just say "Died", which isn't particularly helpful from the vantage point of 2014. The album measures approximately 7-3/4" x 5-1/4" and contains the sentiments of about 86 people. Most signed their pages in the 1860s. An alphabetical list of the signers appears at the end of this post. Adoniram Judson Dunbar was born 26 June 1830 at Brockton, Massachusetts, the son of Perez and Nancy Anne (Willis) Dunbar. Nancy had previously been married to Perez' older brother Ruel Dunbar, with whom she had several children. With Perez Dunbar, she had about four more. On 12 November 1854, Adoniram Judson Dunbar, then a shoemaker, married Irish immigrant Margaret M. Stackpole, daughter, of Bartholomew Stackpole. Later Census records show them living independently of one another. Adoniram died in 1904 in Brockton, Massachusetts. If you have corrections to the information above, or a theory as to the true owner of the album, perhaps even Margaret M. (Stackpole) Dunbar, or information on any of the signers listed below, please leave a comment or contact me directly. Willard Moore Copeland and his wife Sarah Knapp (Leach) Copeland of Raynham, Massachusetts, signed a page on September 15, 1864. Hattie Packard of West Bridgewater, Massachusetts, signed a page numerous times throughout the 1860s. Adoniram Judson Packard was living in a household with her and her parents J. B. and Lucretia Packard at the time of the 1860 Census of West Bridgewater, Massachusetts. Presumably Hattie's father J. 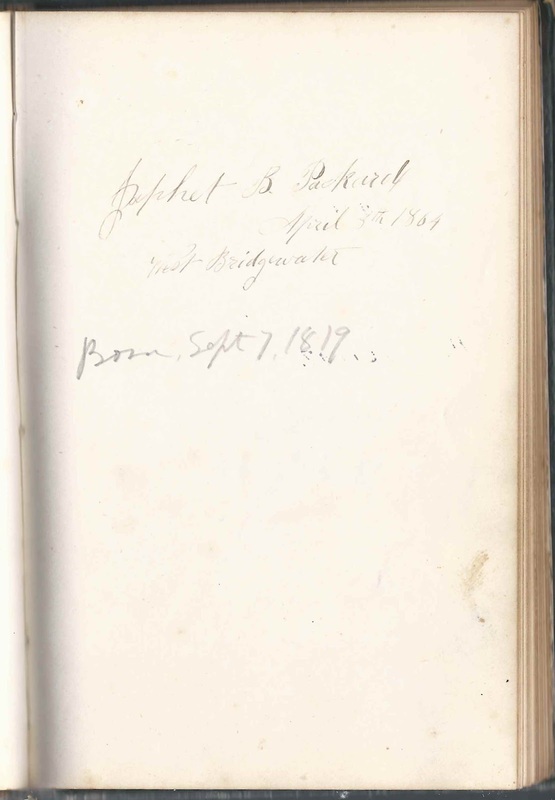 B. Packard was Japhet B. Packard of West Bridgewater, Massachusetts, who signed a page on April 8, 1864. A note added to the page indicated that Japhet was born September 7, 1819. 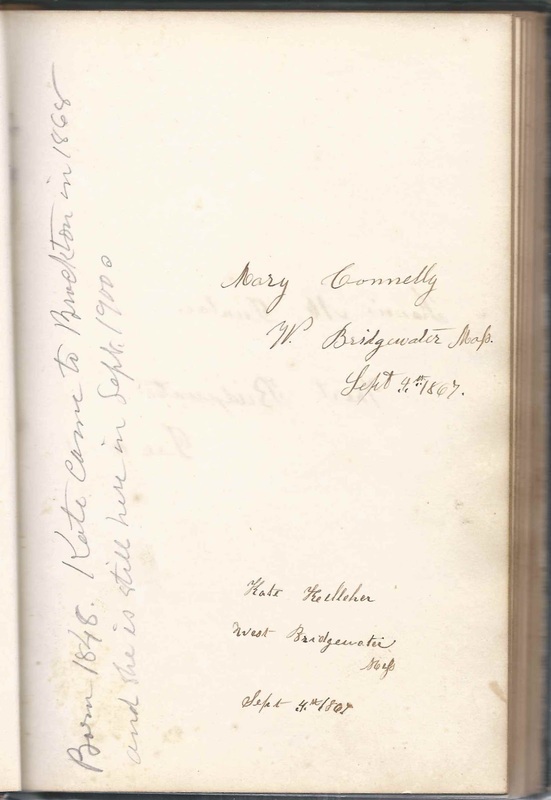 Mary Connelly and Kate Kelleher of West Bridgewater, Massachusetts, shared a page on September 4, 1867. Kate's brother John, who spelled his surname as Keleher, also signed a page in the album. 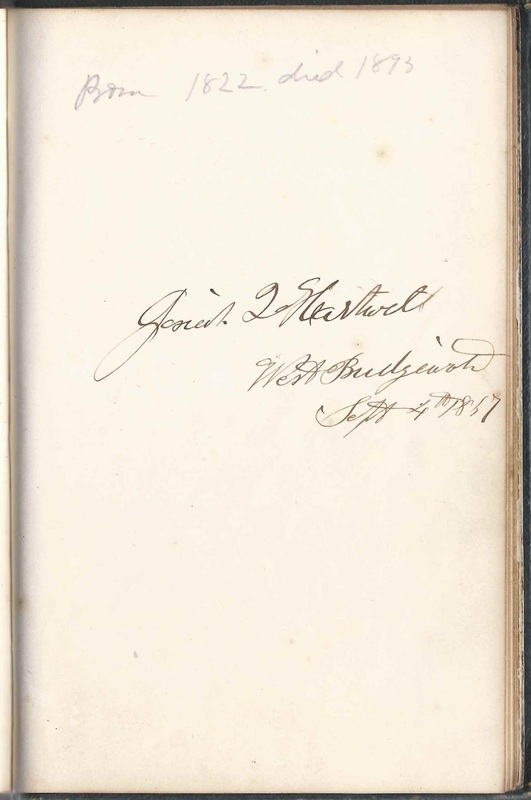 Josiah Quincy Hartwell of West Bridgewater, Massachusetts, signed a page on September 4, 1867 [It actually looks like 1857, but that would have been earlier than any other page in the album.] The added note: "Born 1822; died 1893". Actually Josiah was born in 1823 but that would have been an easy mistake for someone who knew his birth year but not necessarily the month and day of his birth. Abbie Etta Allen of New Bedford; mentioned in a comment that details her marriage to lawyer Charles Carroll King of Campello, Massachusetts, on Thursday, October 12, 1899 at New Bedford. Hattie E. Howard Ames of Cochesett, Massachusetts, signed in September 1864. Note: "Born 1845". She was Harriet Eveline (Howard) Ames, wife of Charles Parker Ames. Nettie Benson of Campalo, Massachusetts, signed on March 4, 1897. Perhaps Campello, but written in a Swedish style? Thankful W. Carr of West Bridgewater, Massachusetts, signed on July 28, 1865. She was Thankful Whitney (Chandler) Carr, second wife of George Gage Carr. Elizabeth S. Caswell of Taunton, Massachusetts, signed on April 8, 1864. Note: "Born 1811. Died." 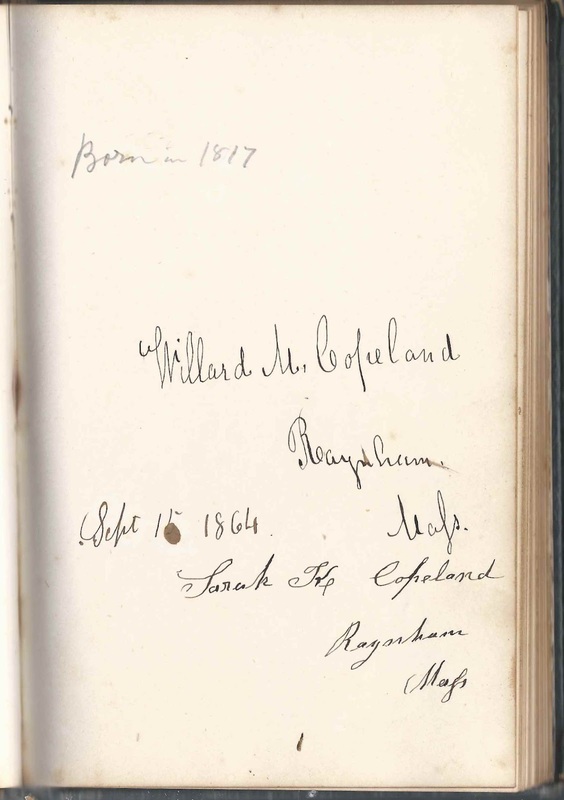 Willard M. Copeland of Raynham, Massachusetts, signed on September 15, 1864. Note: "Born in 1817". He was Willard Moore Copeland, husband of Sarah K. Copeland, who also signed the page. Sarah K. Copeland of Raynham, Massachusetts. 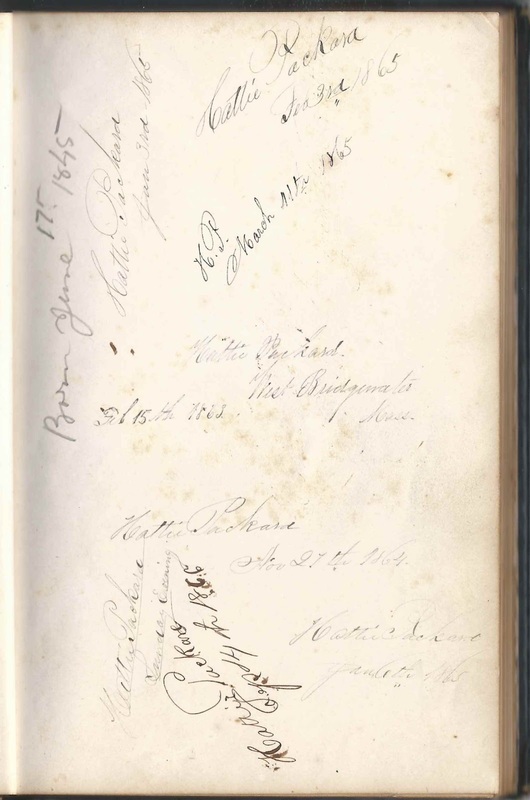 She was Sarah Knapp (Leach) Copeland, wife of Willard Moore Copeland, who also signed the page. Mary C. Copeland, signed at West Bridgewater, Massachusetts, on August 30, 1863. Note: "Born Aug. 1, 1833; died July 21, 1883" She was Mary Chipman (Young) Copeland, wife of Warren Turner Copeland. Ira Copeland. Note: "Born Nov. 1831"; shared the page with his wife Carrie F. (Reed) Copeland and his sister Lucy Copeland. Carrie F. Copeland of North Bridgewater, Massachusetts, signed on August 26, 1864; she was Caroline Frances (Reed) Copeland, who shared the page with her husband Ira Copeland and his sister Lucy Copeland. Lucy Copeland, signed August 26, 1864. Note: "Died 1899". She was Lucy Copeland; she shared the page with her brother Ira Copeland and his wife Carrie F. (Reed) Copeland. Annie A. Copeland of West Bridgewater, Massachusetts, signed on November 26, 1877. Note: "Born 1862"
Fred Copeland, Harvard - not sure if he was referring to the College or to the town; shared the page with Mary E. Copeland and Fred Copeland, unless Fred signed the page twice. Mary E. Copeland. Note: "died". Presumably Mary Elizabeth (Kimball( Copeland), wife of Fred Copeland. Fred Copeland of West Bridgewater, Massachusetts, signed on August 28, 1864. Not sure if this is the same Fred as #1 or a different Fred Copeland, but the handwriting is similar. Fred and Mary Elizabeth (Kimball) Copeland had a son Fred Williams Copeland. 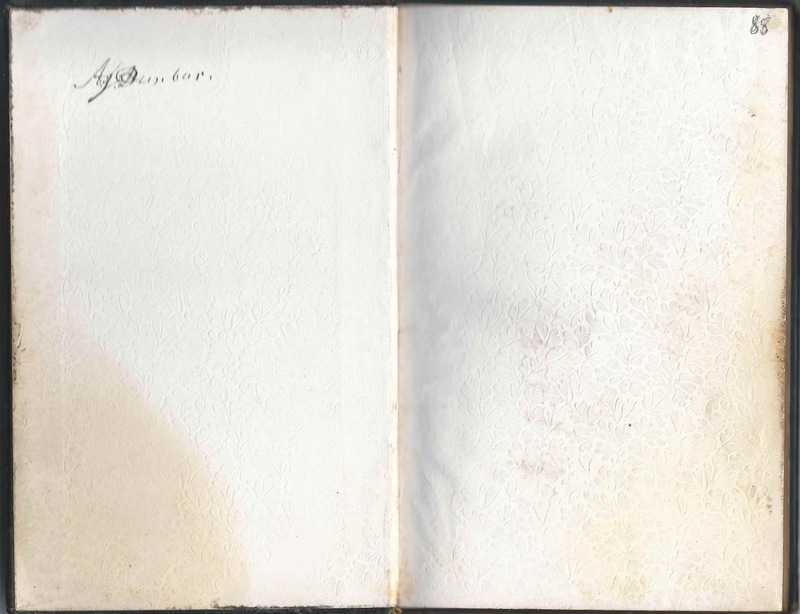 One of the Freds may have been him and may have signed the page long after his parents did. Sibyl Dunbar of West Bridgewater, Massachusetts, signed on May 17, 1864. Note: "Died". She may have been the Sibyl Dunbar whose father Joseph Dunbar and Adoniram Judson Dunbar's father Perez Dunbar were brothers. Or the Sybil (Perkins) Dunbar who married Adironam's paternal uncle Josiah Dunbar and lived until 1877. The facing page was signed by Melvin O. Perkins, perhaps favoring the possibility that the signer was Sibyl (Perkins) Dunbar. Elvira A. Dunbar of West Bridgewater, Massachusetts, signed in March 1864. Note: "Born 1826". She was Elvira A. (Leach) Dunbar, wife of Adoniram Judson Dunbar's brother Perez S. Dunbar. Lavinia Eaton of North Bridgewater, Massachusetts, signed on March 11, 1865. Presumably the Lavinia Eaton who was the mother of signer Annetta Lavinia (Eaton) Sumner. P. P. Field of West Bridgewater, Massachusetts, signed on September 4, 1867. Note: "Born 1822". He was Perez Perkins Field, whose wife Lovice M. Field shared the page. Lovice M. Field of West Bridgewater, Massachusetts, signed in 1867. She was Lovice M. (White) Field, wife of Perez Perkins Field, who shared the page. A. F. Halstrom of Brockton, Massachusetts, signed on March 6, 1897. Middle initial might be T. rather than F. Possibly Alfred F. Halstrom. Jonas G. Hartwell of West Bridgewater, Massachusetts, signed on September 14, 1867. Note: "Died"
Fred Hartwell of Jerusalem, Massachusetts, signed on September 4, 1867. Note: "Dead". According to a note on another page, Jerusalem was in West Bridgewater, Massachusetts. Josiah Hartwell of West Bridgewater, Massachusetts, signed on September 4, 1857 or 1867. Note: "Born 1822; died 1893". Middle initial possibly Q, so presumably Josiah Quincy Hartwell, who died in 1893 - but was born in 1823, an easy mistake if someone was going on his age and date of death. Mercenie Hobbs of Cochesett, Massachusetts, signed on April 24, 1864. Note: "Dead". She was Mercena (Eaton) Hobbs, wife of Nelson Hobbs and daughter of John and Sylva Eaton. V. C. Jackson of Winthrop, Maine. Presumably Virgil Caleb Jackson. John Keleher of West Bridgewater, Massachusetts, signed on September 4, 1867. Note: "John K., brother of Kate. Both lived in 'Jerusalem', West Bridgewater, in 1867" John's sister Kate Keleher also signed a page; shared the page with Michael Sullivan. Lawyer Charles Carroll King of Campello; mentioned in a comment that details his marriage to Abbie Etta Allen of New Bedford, Massachusetts, on Thursday, October 12, 1899 at New Bedford. Mary E. Kingman of West Bridgewater, Massachusetts, signed on July 10, 1863. Note: "Born 1833"
Mary F. Lindsey of West Bridgewater, Massachusetts, signed on August 9, 1863. Note: "Born 1840. died 1892"
Augustus Linfield of Randolph, Massachusetts, signed on August 21, 1864. Note: "Born 1843, died"
Hattie Packard of West Bridgewater, Massachusetts; signed the page on multiple occasions in the 1860s. Note: "Born June 17, 1845"
Elijah Packard of West Bridgewater, Massachusetts, signed on August 30, 1863. Note: "Died"
William A. Packard of West Bridgewater, Massachusetts, signed on August 30, 1863. Note: "Died 1897"
Japhet B. Packard of West Bridgewater, Massachusetts, signed on April 8, 1864. Note: "Born Sept. 7, 1819"
Victoria P. Packard of West Bridgewater, Massachusetts, signed on September 5, 1867. She was Victoria P. (Crossley) Packard, daughter of James and Mary Crossley and wife of Emory Packard, with whom she shared the page. Phebe M. Packard of West Bridgewater, Massachusetts, signed in 1865. Fred H. Packard of West Bridgewater, Massachusetts, signed on April 15, 1870. Note: "Born Feb. 2, 1854"
Enna M. Packard of West Bridgewater, Massachusetts, signed on September 15, 1864. Note: "Born in 1847"
Lilla I. Packard of Worcester, Massachusetts, signed on August 29, 1864. Note: "Died" Not sure of middle initial, but there was a Lilla I. Packard who died in 1877 at Worcester, Massachusetts; born about 1853 to William and Betsy (Eaton) Packard. Emma A. Parker of Mattapoisett, Massachusetts, signed on April 13, 1876. Note: "Born 1845"
Melvin O. Perkins of West Bridgewater, Massachusetts, signed on June 25, 1864. Note: "Died". He was Melvin Otis Perkins, son of Nathaniel and Hannah (Hayward) Perkins. Will Rider, Jr. of North Bridgewater, Massachusetts, signed on March 22, 1865. Note: "Dead"
Lucy M. Rogers of Holbrook, Massachusetts, signed on December 2, 1881. Note: "Died"
Elbridge Snell of East Stoughton, Massachusetts, signed on June 19, 1864. Note: "Died 1867, aged 60"
Mary E. Snell of East Stoughton, Massachusetts, signed on June 19, 1864. Note: "Born May 9, 1852"
Elizabeth Snell of East Stoughton, Massachusetts, signed on June 19, 1864. Note: "Born May 9, 1814"
Francelia A. Snell, signed on September 14, 1866. Notes: "Born in 1845" "Died"
Michael Sullivan of West Bridgewater, Massachsuetts, signed on September 4, 1867; shared the page with John Keleher. Annette L. Eaton Sumner of North Bridgewater, Massachusetts, signed on April 24, 1864. The word Stoughton is a bit off to the side. Note: "Died" She was Annetta Lavinia Eaton, 2nd wife of Ebenezer Sumner; they lived at Stoughton, Massachusetts. I believe the Lavinia Eaton of North Bridgewater, Massachusetts, who signed a page, was her mother.